When the tranquil surroundings sooth your senses, being in the state of perpetual happiness is not a daydream. Bhutan is considered among the happiest nations in the world and the Himalayan kingdom has numerous reasons for that. With various monasteries ensconced in calm confines, you are directly in touch with your inner soul, the real you. The scenic beauty of the monasteries like Tongsa, Taktsang, Tango and Chery will enthrall you to the core and still you remain as calm as ever. On arrival at Paro Airport, meet our representative & transfer to Thimphu ( Alt. 2400m/7875ft). Check in at the hotel. Afternoon you can relax in the hotel or you can visit interesting weekend market (The Centenary Farmer’s market ) (Open only from Friday to Sunday ) -Vegetable vendors from different area of the country come to sell their products. In the evening you can explore the city by walk or visit Tashichho Dzong, presently houses the throne room and offices of the king, the secretariat and the ministries of home affairs and finance. You can explore only outer view of Tashichho Dzong or you can visit Monk Body’s block between 5:30-6:00 p.m ( Timing may change). Overnight in Thimphu. After breakfast proceed for sightseeing includes National Memorial Chorten- This stupa was built in 1974 in the memory of Bhutan's third King, His Late Majesty, King Jigme Dorji Wangchuk, who is popularly regarded as Father of modern Bhutan ; Buddha Point (Kuensel Phodrang), visitors can get a good overview of the Thimphu valley from here; Chang Gangkha Monastery, the oldest temple in the valley; Takin Zoo, Preserve center of Takin - National Animal of Bhutan. Afternoon visit Changlimthang Stadium & Archery ground; The Jungshi handmade paper factory ( Closed on Saturday, Sunday & Govt. Holiday), that uses traditional methods to produce the authentic Bhutanese paper known as Deh-sho; Institute for Zorig Chusum Commonly known as 13 Arts & Crafts School or Painting School ( Closed on Saturday, Sunday & Govt. Holiday),where students learn 13 different arts used predominantly in Bhutan and local crafts shops. Overnight in Thimphu. After permit (Permit is not issued on Saturdays, Sundays & Govt holidays) drive to Punakha/Wangdue, with a stop en route at Dochu La Pass ( 3,100 meters), where on a clear day you can get spectacular views of the highest mountains of Bhutan. After a photo break, drive to warm valley of Punakha. 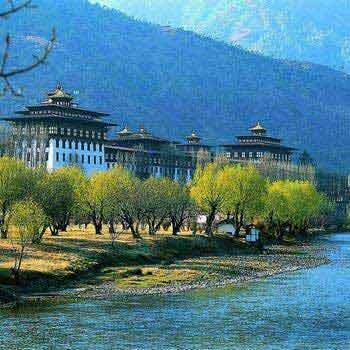 Visit Punakha Dzong built at the confluence of the Po and Mo Chu Rivers in the 17th Century by Shabdrung Ngawang Namgyel and served as capital of Bhutan until 1955. 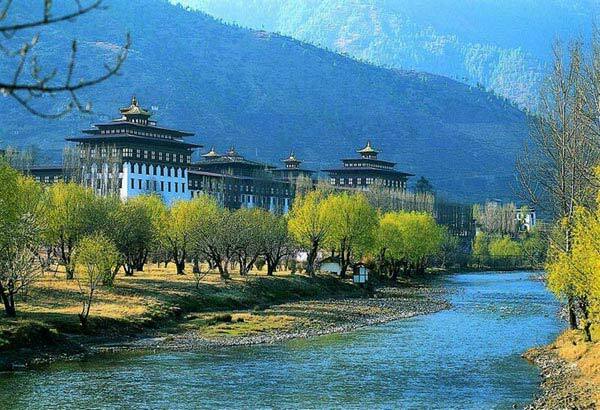 (Note: The Punakha Dzong is closed in winter months when the monk's body is in Punakha) Also visit Sangchen Dorji Lhendrup Nunnery in Punakha. Overnight in Punakha/Wangdue. After breakfast drive to Paro ( Alt. 2200 m/7,300 ft). On the way enjoy the view of Shaba River Point and Paro airport view. Check in at the hotel. Overnight in Paro. After breakfast proceed for sightseeing includes Ta Dzong (National Museum) - the first of its kind which has a collection from natural history to religious paintings and then walk down the trail to visit Rinpung Dzong (also known as Paro Dzong) which has a long and fascinating history. Afternoon visit Drukgyel Dzong, the ruined fortress from where Bhutanese repelled several invasion by Tibetan armies. Later visit Kyichu Lhakhang, one of the oldest and most sacred shrines of the Kingdom. Evening stroll at Paro town and peep into some local handicrafts stores. Return at hotel. Overnight at Paro. After breakfast drop to Paro airport for your onward journey.